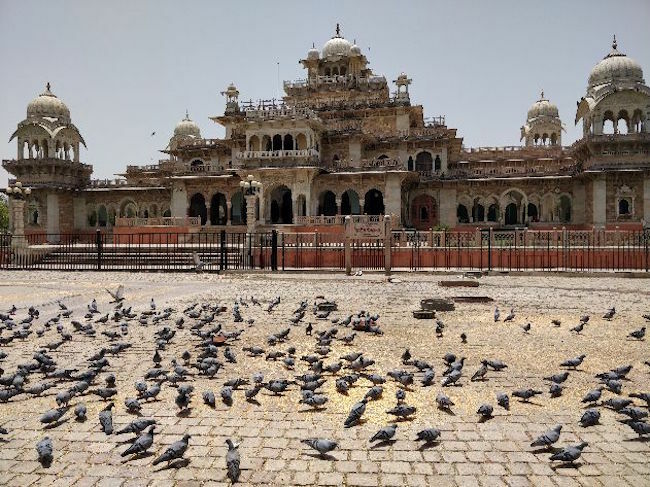 This is a 14 to 16 day backpacking tour in Rajasthan catered to young travellers looking at northern India as a destination. You’ll travel across Rajasthan, stopping at the magical desert town of Jaisalmer, the beautiful blue town of Jodhpur, Udaipur the city of lakes, the spiritual and religious haven Pushkar and more. If you’d like to go on a similar route but need help optimizing your time and money, get in touch with us and we’ll help plan your trip perfect for you. Because your primary transport will be trains, this tour is quite economic. Trains are fast, dependable and a great way to experience north India and interact with the locals. We love travelling by train and the feedback we’ve received has invariably been that it was a delightful cultural experience and comfortable (especially the A/C class). Let us know how many travellers you would be and your wish list and we will help you plan your trip. It is often said that India is not a holiday, but an experience. Travelling across North India will leave you with memories of a lifetime. Highlights of your India experience will vary from traveller to traveller, but here are some highlights that you can look forward to for this backpacking tour in Rajasthan, Agra and Delhi. Delhi can be overwhelming but it’s so worth it. Delhi has an incredibly rich history, interesting architecture, and great food (and we mean it). Expect to see a mix of charm and bustle in Old Delhi and glistening manicured lawns in New Delhi. Getting around can be surprisingly easy with the new amazing metro system. Click here to read impressions of Delhi as experienced by young travelers from Austria. 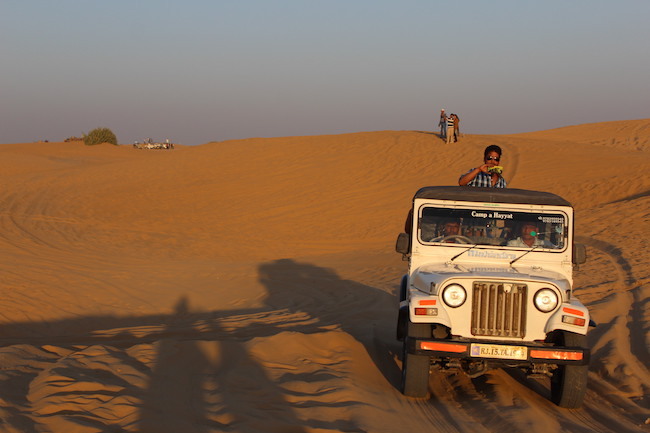 Jaisalmer is truly incredible, but the effort to get makes it all the more satisfying. You’ll take an overnight train from Jaipur to reach Jaisalmer. The old city is beautiful, crafted in stone, sand and rock. Nicknamed the ‘Golden City,’ it’s by the edge of the Thar Desert where you’ll spend night after picturesque sunsets. Trains in India are a fascinating experience. There’s a distinct buzz of energy at the stations and you get lovely chai while on board. You get to see Indian families and often interact with them. 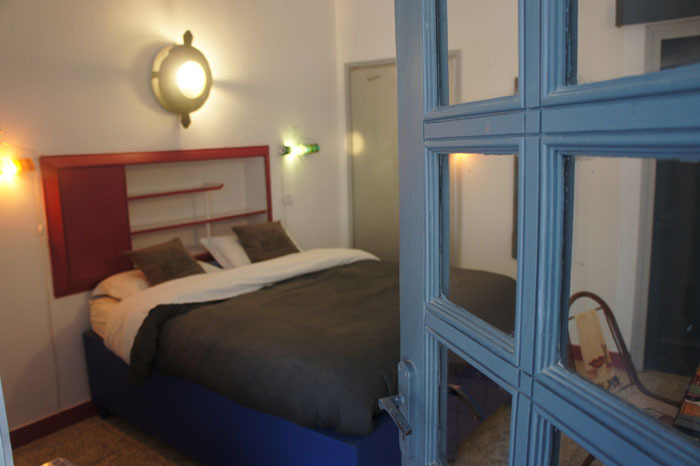 Above all, you’ll see beautiful views of the countryside and little villages. 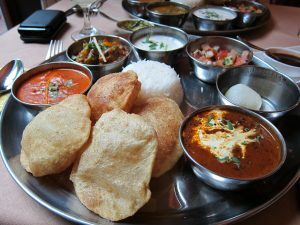 For a foodie, India is the ultimate paradise. Treat yourself to amazing naans (Indian bread), curry, lassi, Indian sweet and much more. Home cooked food is always better, so the homestays will have amazing food. Do remember, the food can get a little on the spicy side. The hostels and hotels will allow you to meet a variety of interesting travellers along your backpacking tour in Rajasthan. This is always a plus, as you’ll make new friends and even stay with local families and soak in their traditions and culture. You would be visiting the Taj Mahal. Do not miss the Agra Fort or the Baby Taj while you are in Agra. Click here to read impressions of Agra as experienced by your young travellers from Austria. 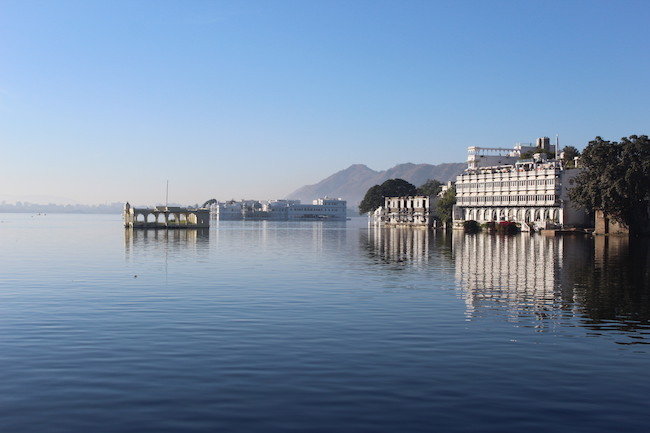 One of your last stops will be at the beautiful lake city of Udaipur in all its splendour. The following image might give you a glimpse of how beautiful it is. The following tour can be customized to the number of days you are looking at travelling or places you’d like to see. In fact, we can help you plan trips to anywhere in India irrespective of your budget. So what are you waiting for? Get in touch with us to plan your trip to India and don’t forget solo travelers get a 20% discount on our fees! I recently visited south Rajasthan on a backpacking tour . It was a memorable experience. Wanted to share the same with you and your readers. Keep posting as I regularly follow your posts. Best of luck for future adventures. Do visit by post on Rajasthan. Here is the link. This is a very nice blog. If you went to travel Delhi, Agra , Rajasthan other places in India by train.